'Julie & Julia': A Slightly Contrarian Defense Should Julie & Julia have just been a Julia Child biopic instead? We look at a couple of reasons why that might not have worked. I'm not surprised by the reviews of Julie & Julia that consider it a movie in two parts, where the half that involves Meryl Streep playing Julia Child feels important and the half that involves Amy Adams playing Julie Powell doesn't. I'm not surprised by those who wish it were just a movie about Julia Child. But I think they miss the point a little. It's important, I think, to understand that nobody is trying to compare the accomplishments of these women. Nobody is claiming that Julie Powell's year-long blog project cooking everything in Mastering The Art Of French Cooking puts her on an equal footing with Julia Child -- least of all Julie Powell. There are beats of similarity in their stories, in that they're both married, and in that they both love cooking and feel brought to life by it. But to recognize that one of these women dwarfs the other in stature isn't to undermine the movie; it's to grasp the entire point of the movie. The reason their stories make sense next to each other is not because they lived parallel lives or because Paris equals Queens. The reason their stories make sense next to each other is that Julia Child was someone who functioned in popular culture as a teacher -- it's hard to think of anyone who did that any more successfully than she did, in fact. And most people who became effectively Julia Child's students weren't anything like her -- they lacked her seriousness about cooking, her depth of knowledge, and her track record of hard-fought accomplishments. But that's part of what made her so great: she could teach regular, ordinary, untrained people to care about food and to make food. And to get that across in full, you need to show how that brings something of value to even a regular, ordinary, untrained person. That Julie Powell is ordinary is what makes Julia Child's accomplishments so extraordinary. Julie isn't French, isn't trained, isn't wealthy, doesn't own every implement known to Williams Sonoma, and is operating in a kitchen so cramped she can barely turn around in it. But Julia Child's lessons nevertheless make sense to her. Julie, in the movie, is there to serve the story of Julia Child, just as Powell's blog project was -- as much of a stunt as it was -- most effective as an exercise in wonder at the genius of Julia Child. Child as a person is a story you could have told the way most reviewers seem to wish it had been told: as a straight-up biopic, following her from, say, her arrival in France through her television career. But that wouldn't really explain Julia Child as a teacher. That wouldn't tell you why it mattered. That wouldn't tell you why her book was important. You can't tell a story about a brilliant teacher and leave out the students. The fact that this book, first published close to 50 years ago, still makes people want to go out and try poaching an egg just because suddenly, poaching an egg seems like an interesting and important thing to know how to do? That's kind of great, and you need the Julie Powell side of that story to get it. 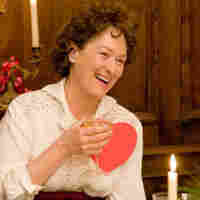 As great as it would have been to watch Meryl Streep be Julia Child for two hours -- heck, I could have watched it for four or five, it's so delightful -- I don't think losing the student side of this particular teacher/students story would have gone as smoothly as it perhaps feels like it would.